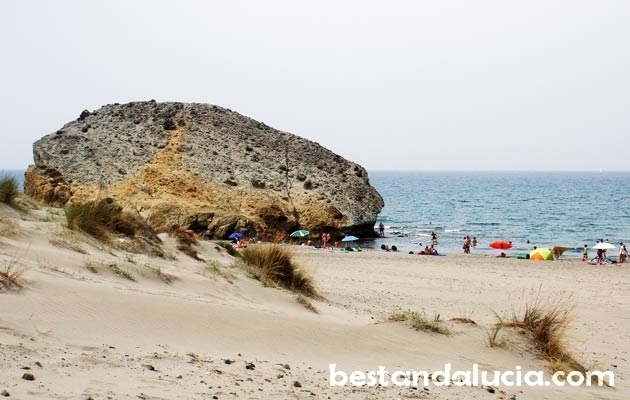 Natural Park Cabo de Gata boasts several marvellous beaches. 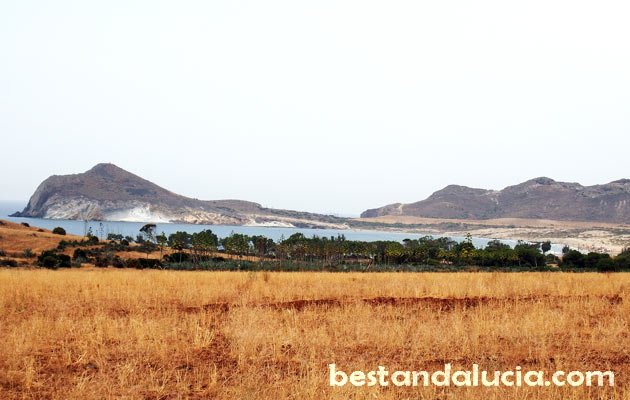 Devoid of the massive tourist development, the spectacular Cabo de Gata park has managed to preserve it’s natural beauty and it’s virgin beaches are real pearls. Amazing mountain views, colourful cliffs, volcanic rock formations, sub-desert lunar landscape, both pebbled and sandy beaches and crystal clear water. All this you will find on the Cabo de Gata coastline. 1. Los Muertos beach – northernmost of the beaches in Cabo de Gata. The access to the beach is very difficult, definitely not suitable for elderly people. You need to park your car on the top of a hill (the fee in summer season is 4 Euros) and from the parking place there is a 1 kilometre long trail down the rocky slope which leads straight to the beach. It takes around 30 minutes to reach the beach. The northern side of the beach is dominated by nudists, the southern part is for other beach goers. The water is crystal-clear, but the waves can be big sometimes. Because the beach is located in a very remote place it’s never overcrowded. In fact, off-season it is mostly empty. There are no beach bars or any other facilities at the beach, so don’t forget to bring plenty of water as well some sun protection. There is no sand, only pebbles everywhere, which makes the water crystal-clear and very enjoyable. Tip for photographers: the best view of the Los Muertos beach is available from the balcony viewpoint towering over the beach. There is a very steep path connecting the balcony with the beach, so if you are a fit, you can try reaching the beach this way. 2. El Playazo beach – is located near the village of Rodalquilar. 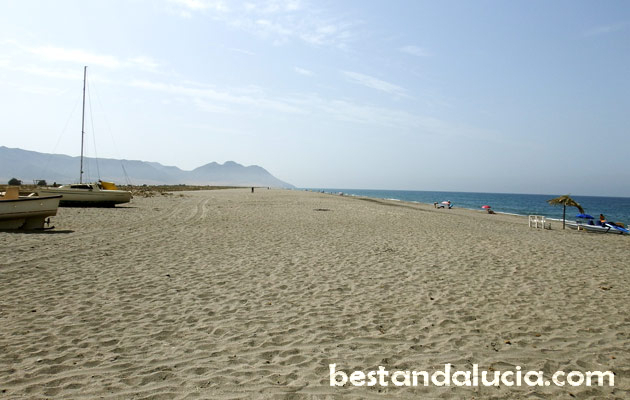 Unlike many beaches in Cabo de Gata, this beach can be accessed very easily by car which makes it a great family beach. The narrow half paved half dirt road (no stones) leads straight to the small parking place at the beach. In high season most people park their cars along the road. The beach features ruins of the eighteenth century San Ramon’s Castle. The small northern part of the beach, divided from the main beach by big rocks, is popular among the nudists. The main beach is or the regular beach goers. The water is very peaceful and shallow everywhere, so the beach can be recommended to the families with kids. It’s a sandy beach, another argument to bring your kids here! 3. 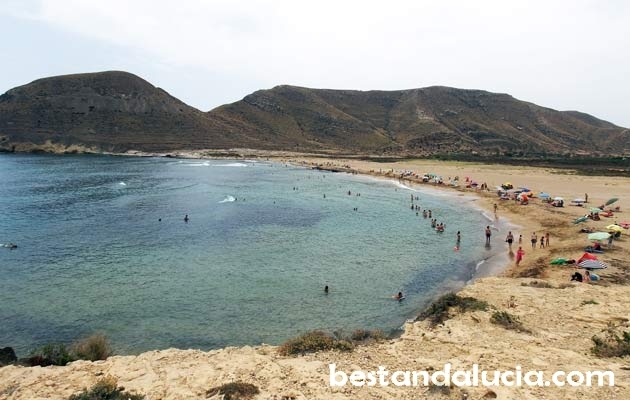 Monsul beach – is located in the southern part of Cabo de Gata, past the village of San Jose. This sandy beach with nice shallow water has no beach facilities as it is located in the nature park. 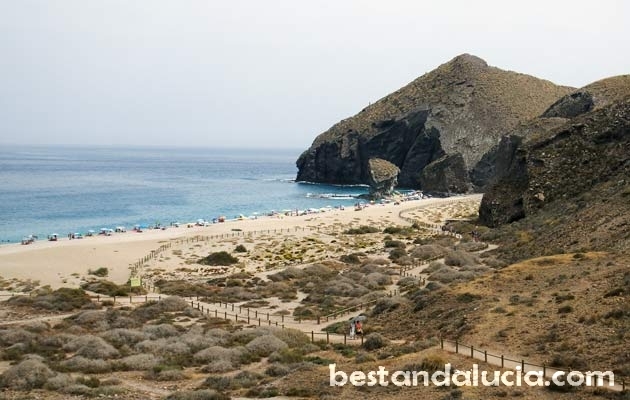 Playa de Monsul is a volcanic beach boasting some amazing rock formations. On sunny days the oddly shaped rocks give plenty of shade to the beach goers. The unique beauty of the beach made it popular among film directors and producers of commercials. For example, Indiana Jones and the Last Crusade by Steven Spielberg were filmed here. To access Monsul beach you will have to drive a couple of kilometres on an uneven dirt road punctuated with small rocks. Drive very slowly, or else it will be a nightmare for you cars’ suspension, unless you are driving an SUV. 4. Los Genoveses beach – the access road is the same as to the Monsul beach, luckily, however, much shorter. Turn left at the first fork in the dirt road to get to the Los Genoveses beach, the path on the right leads further to the Monsul. Los Genoveses is a very long sandy beach, great for families with kids as the water is shallow and warm. No beach facilities are available. It’s often frequented by nudists. Playa Los Genoveses is located about 2 kilometres from the village of San Jose, so you can also get there by local bus (2 Euros), but you will still have to walk some distance from the bus stop. 5. 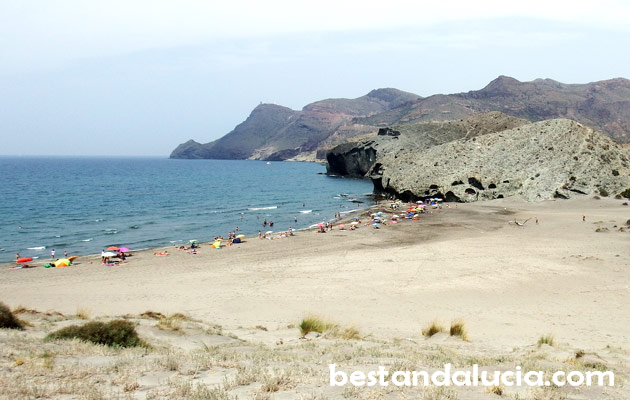 Cabo de Gata beach – nice beach located south of the small town Cabo de Gata, only 20 kilometres from Almeria. The beach is easily recognizable by a big fenced lighthouse, and it’s very easily accessible as there are no hills around. The parking is located almost on the beach itself. The town’s paseo maritimo with two or three restaurants is located some 200 metres form the beach. It’s a calm pleasant beach with very few people coming here even in high season. 6. 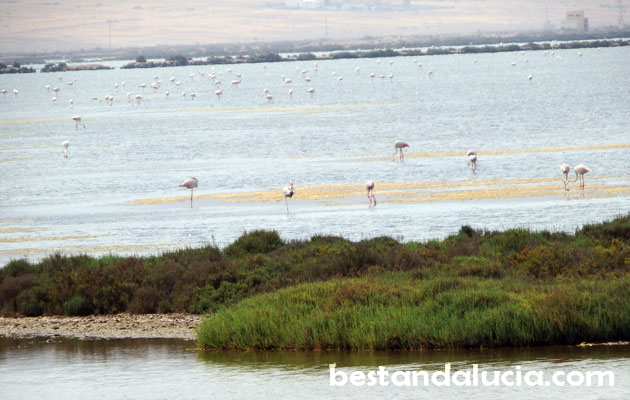 Las Salinas wetlands – it’s not exactly a beach, but the place deserves a closer look if you are nearby on the beach. If you are a birdwatcher this is a must stop. It’s located just next to Cabo de Gata local beach. The place is a resting place for all kinds of birds, both migrating and resident, nearly 100 species. In summer, the lagoon swarms with migrating Greater Flamingos which can be quite a sight. There are a couple of observing points located around the reservoir and the whole place is fenced to make sure you do not disturb the birds.